This was the spring for back-to-back health issues. All were different and I’ve recovered. I don’t need sympathy but Starbucks gift cards are good! “They say” hard times make you grow. They just make me cranky. I am not a great patient! Never was, just ask my mom. About the time my dental issues eased, I picked up a virus with a high fever. Just as that subsided (I was 23 hours fever-free) I threw my back out. This is the most bizarre series of back luck I’ve ever had. Nothing was related. There were some funny, poignant or learning moments along the way. I am the worst hypochondriac there is. 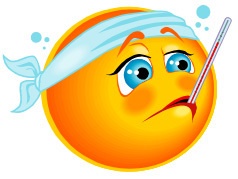 When others have a cold, I’m on death’s door with what I am sure is a confirmed case of fatal pneumonia! However, I missed an opportunity to latch onto something big. The first sign I was sick was my mocha latte. It didn’t taste right. I did the American thing and blamed the barista. It was later in the day when I knew something was wrong. I wanted to run around naked (for comfort!). I had a substantial fever. I never want to be naked! I visited my primary care doc. He did some testing then he told me he eliminated meningitis, Dengue, West Nile and Chikungunya fevers. I never thought to worry about those. I have to do more googling next time I get sick. Don’t want to miss worrying about any of the BIG ones. He asked me if I was anyplace exotic. The international aisle at the grocery story didn’t count. Nor did the liver spot on my leg count as a rash. However, I got a plus for humor. Cats know. All four of them knew. They each had their assigned duties, one of which was to check me at 3 a.m. to make sure my cat feeding hands still worked. They did that by hopping on my chest to see if I jumped. All good. We all lived. No matter what they say, they didn’t miss a meal. Daytime TV hasn’t changed much since I was sick in 2003. Rachel Ray is now on network TV instead of the Food Channel and there are more stupid game shows. If you look enough you can find reruns of the Golden Girls which are very soothing. A big thank you to the ever patient beloved husband who did all the duties except the cat litter. He was patient when I didn’t know what I wanted to eat or if I wanted to eat. He bought me things I thought I wanted only to find out I changed my mind. He picked up take-out and hot dogs. (Who gets a craving for hot dogs when they are sick?) He changed the bedsheets because I’d sweat them up. I am very grateful that I had help (and fresh sheets!). I have a renewed sympathy for people who do not feel well whether it’s a fancy illness or something nondescript. The next time I encounter a cranky person, I will wonder if they feel ok. I’ll give them the benefit of the doubt. How about you? Are you a better caretaker or sick person? This entry was posted in Aging Gracefully, Health, Humor, Life at Home and tagged caretakers, dental issues, Health scares, Illness, mosquito bite illnesses, patience, recovery, sickness, viral illnesses, viruses by Kate Crimmins. Bookmark the permalink. Wow! Three things in a row. That deserves a little crankiness. I’m glad you’re better now. You feel hot when you have a fever? I feel cold. I crank the heat up and wear a sweater. I was also sick in May. After my trip to NM, I had a fever for five days or so. One doctor said pneumonia (the one I saw late on a Saturday night); another (my regular doctor) said maybe bronchitis, but just in case take the antibiotic. Getting sick is the worst thing about living alone. There’s no one to do anything for you. I’m not a good nurse. I try, but … I’m a pretty good patient–don’t complain too much, and I take my medicine. I was very grateful for my husband especially with the back issue. He did all the lifting. I have a renewed admiration for people who live alone. With four cats thee was no way I could just crawl into bed for a week. At least I had help. Yes, yes 2 days later and I am just reading this post! I don’t think I am a good patient or caregiver. (Let me rethink that…) As a kid, I enjoyed the attention. As an adult, I am sure whatever is wrong (even a hangnail) will put me in the dirt. And lately I have more pains and aches then I have ever had. I am not happy about this. As a caregiver, well, I am really terrific. I hate being a caregiver. Having said that, I do what has to be done, don’t complain and my “patient” is non the wiser. 🙂 My primary symptom was a terrible non-stop headache (which I never get) with the fever. I was thinking fatal brain tumor not meningitis or all the other fevers. I’m an ok care-taker. If it’s someone I care about, I can be adequate. I fake it as best as I can! “I did the American thing and blamed the barista.” So true! Feel better, Kate! I have a good tasting Starbucks mocha with me right now! That IS a string of bad health luck. Yuck. Glad you’re feeling well enough to have a bit of humor attached, and I’m glad you don’t have any exotic diseases. Sometimes those “run of the mill” viruses are the worst. I’m recovering (way too slowly) from a health issue also (blogging about it tomorrow) and like you, I’m so thankful for my guy, who like yours, took good care of me. My answer to your question? I much prefer to be the caregiver…. It was and to some extent still is. Backs take a long time to heal. Nothing was related. The oddest thing was that nothing was respiratory or digestion-related. Looking forward to your post! First, I’m glad that you’re doing better. Being under the weather just isn’t worth it. Second, I’m not one to suffer in silence when I feel lousy, so I’d say in answer to your question that I’m better at being a caretaker than being a sick person. Third, I don’t like daytime TV and wonder how any of it can be there on the TV. At least you found something worthwhile to watch… and confirmed my suspicions that daytime TV still sucked. It would have been helpful if the weather had been nicer too but it wasn’t. Onward and upward! So far this has not been a good year for many reasons although I am happy that it hasn’t been worse. It can always be worse. Very true – so glad it hasn’t been major problems. Although the little problems are no fun either! I’m used to taking care of myself – except for when I broke my dominant wrist in 5 places. I needed help until I figured out how to use the left hand. My husband stepped up. Thank goodness! I had fractured my knee several years ago and it was awful not being able to drive and get around on my own. Four weeks on crutches. I was very cranky. I would be too. That’s pretty difficult to deal with. Being inactive was more difficult than I thought. I idea of reading books sounds nice but after a while I like to do stuff. Oh, yes. And there is the stress of u washed laundry, I purchased groceries, and the good feeling of moving out bodies. You can order groceries to be delivered these days, but moving your body is a different thing. Good luck! So glad you were able to keep your sense of humor in all of this! Glad you are feeling better. To be honest, I had much more humor after the fact! I too am a dooms-day-er sick person. A better care giver maybe if I can wear a mask and surgical gloves and open all the windows. Only a dog sees my hidden goodness. However I rejoice in those like you who emerge unscathed and in high spirits. ☺ Stay well! I’m glad those awful illnesses and ailments are behind you. What trials you had! I’m not sure whether I am better at being sick or being the caretaker. John is very rarely under the weather, so I haven’t been truly tested. Changing the subject, would y’all be available on Friday, June 22, for one hour sometime mid-afternoon? We would love to meet you as we pass by on the way to grandson Nathaniel’s high school graduation. I would suggest no food or drink, since that would distract me from getting to know you in depth in 60 minutes. If it might work, could you reply on my blog in the Contact Me section? I could then send you my email address and cell phone number. My fingers are crossed that this could work. I will check my schedule and get back to you. I am less than a mile off of 78. Woohoo! I haven’t been to New York since the trip where we stopped to see Dor in Virginia on the way up. She’s on my list if I get down that way! Oh Ugh. The first year we moved back to Illinois, I had a flu that I was sure I would not recover from. It captured my bronchial tube and gave me a pinhole to breathe through. I had a low-grade fever for 2 weeks. I seriously didn’t think I was going to make it out alive. I’m glad to hear you made it through and are doing well. It’s a terrible thing to go through, though. Finding anything on daytime TV is a challenge. HI, Kate – I am so sorry to hear that you had a triple-whammy of illness. I am glad that you are feeling better now. BTW – I am glad to read that your resisted the temptation to run naked…especially if you were in Starbucks with your bad tasting mocha latte at the time! I don’t even like to be naked in the shower! Your humour once again has seen you through Kate. I hope you feel 100% soon. As for me, I hate being ill……… just leave me alone to die quietly in my bed in the dark. As a carer, the jury’s out on that one. I have little patience (no pun intended, OK, maybe) and though I worry about Hubby, he’s so stubborn at pushing himself beyond his limits, I get madder at myself for caring so much! I get that. There is nothing as bad as a patient who doesn’t listen! Lucky for me, it’s been awhile since I’ve been either. Never heard of that last one! I must try that one for good luck. I’ve been told that I’m a good nurse and a non-complaining patient. I’m happy you’re back to yourself, Kate. Next time I’m sick (or my husband is) I’d like you to move in for a week! He is a far better caregiver than I am although I really try. I would have said I was better at taking care of others, but after 6 months of disabled husband with no mobility and then minimal mobility, I have no caretaking reserves. I’m a hairsbreadth away from telling the cat to open her own can of food. And you know that’s gonna go over well. I’m with you. Not a good patient and not a good caretaker. There must be a third category! The international aisle at the supermarket… ha, good one! I am glad you are feeling better. I’m not sure if I’m a better sick person or caregiver, but I know which I’d rather be. When the doc asked if I had been anywhere exotic, considering my limited diet, it took me over the edge. There are some Pacific Islanders who would consider where I live exotic.